I am not ashamed to say I love tinned corned beef as much as I love Spam or Chinese luncheon meat. I don't like plain corned beef straight from the tin for sandwiches. We always had it stir fried with onion. Every time I make this I can always eat a big bowlful of hot steamy rice. It's trashy but tasty comfort food, sometime it's what I need. Any leftover I normally make sandwiches. This recipe is what my mum used to cook for the family since I was a kid. I reckon similar recipe is common to many S E Asian Chinese. Stir fry onion with cooking oil till onion is soften. Add corned beef, mash it with the cooking spatula/spoon. Add kecap manis, soy and sugar to taste. Stir fry for about 5 minutes, keep stirring to avoid sticking till the corned beef is quite dry. Stir in the chilli. Add in the beaten egg, do not stir till the egg is beginning to set, stir to combine. Beaten egg absorbs the moisture from the corned beef mixture making it drier. You may have noticed from the picture I did not add egg because I ran out and I was too lazy to go to the shop. It was still as nice. 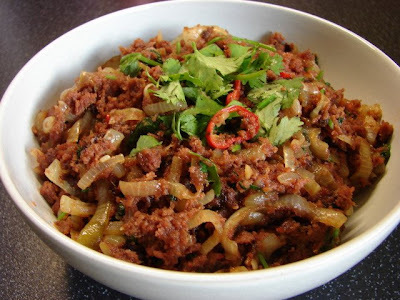 If you like this stir fried corned beef a bit more spicier, add a tablespoon of hot curry powder/curry paste when frying the onion is also very nice. I also love corned beef! I've never done anything other than use it in sandwiches (which I love, with pickle). I'll give this a go. I'm also a spam fan too!